People talk a lot as they toil up the zigzag or wander down. There are so many: mostly I tune them out. So yesterday, when someone walking up the path said ‘It’s beautiful’, I kept weeding, worrying because this year my zigzag plots don’t look as good as they did last year. And although they attracted many bees in spring, as summer progresses there are fewer. The woman on the zigzag repeated herself. I turned around and there she was, expensive camera in hand. ‘Well, enjoy it’, I said, knowing from other tourists that they really enjoy the domestic scale of the zigzag, the historic houses as much as the gardens. ‘Because soon that house over there at no. 1 – which is older than the big brick monastery it’s next to – will be sold. And the site probably redeveloped’. And then she left, trudging up the zigzag to her companion, leaving me in my wild zone with mixed feelings. And a couple of hours later one of those huge cruise ships sailed past. I waved, in case she was looking this way. And thought about what’s working and what isn’t. 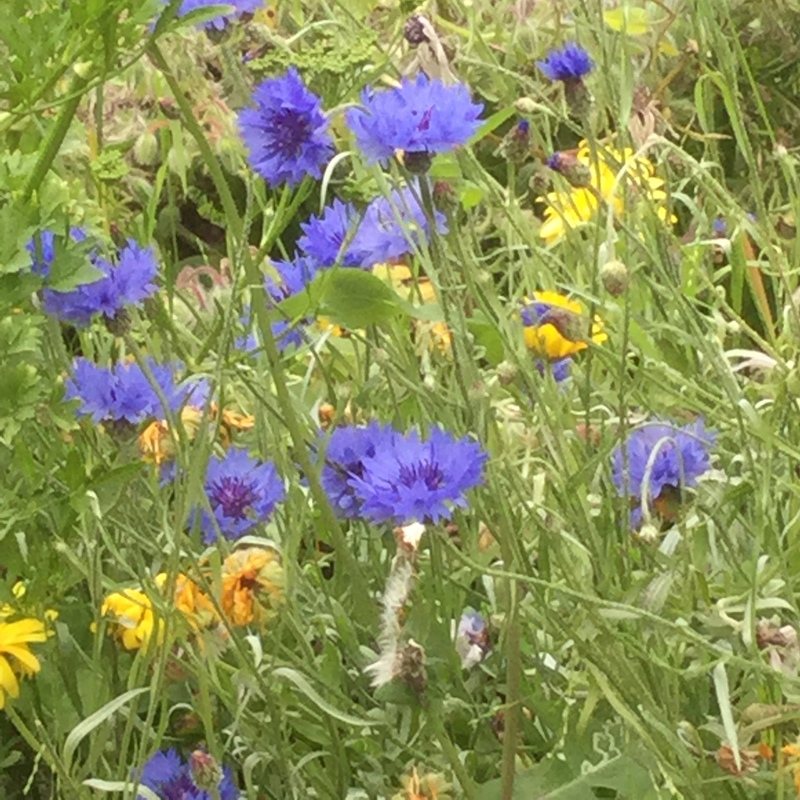 Annuals like these cornflowers now self seed everywhere. I love the blue. And I’m very pleased that clover has spread, because that’s great for the soil. 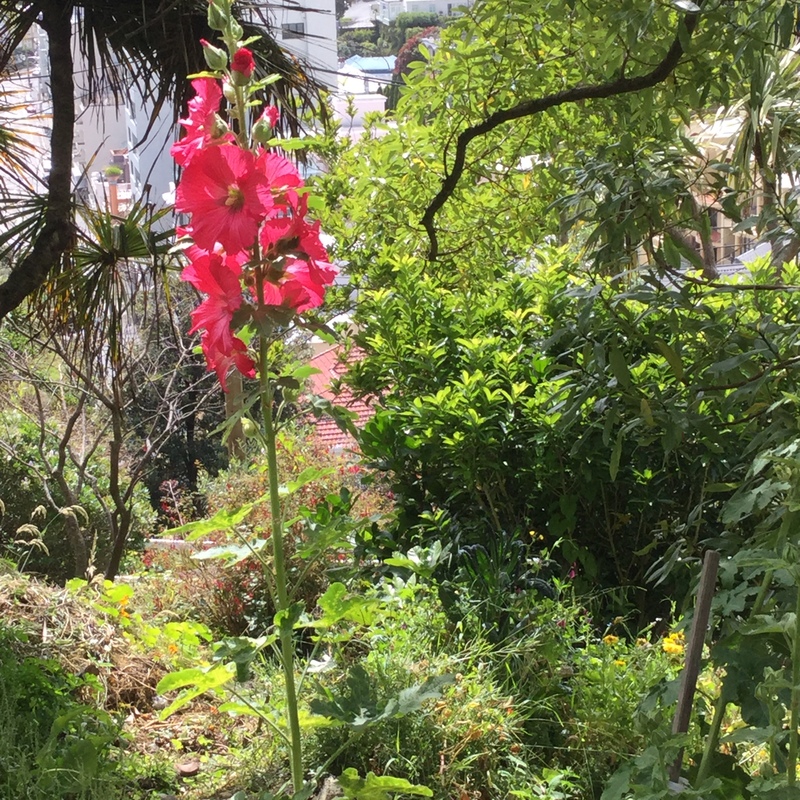 And the first of my perennial hollyhocks grown from seed have flowered, too. 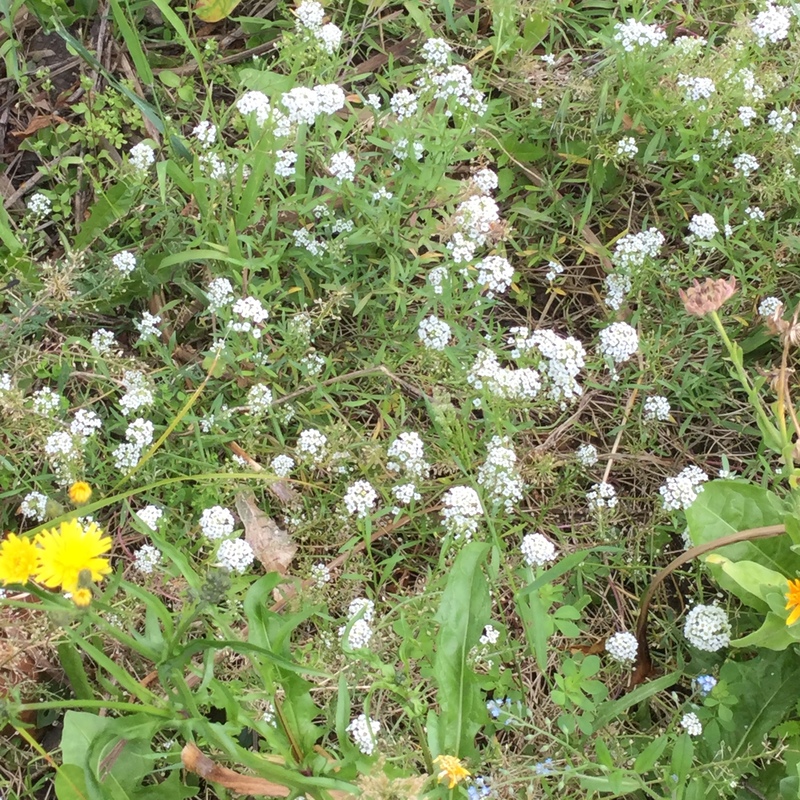 I’ve learned that honey bees and bumble bees have no interest in alyssum in this part of Wellington, whether it’s spring or summer, near fruit trees, in sun or shade. But because it spreads so well, I’m leaving it wherever it grows. Around the hugelkulturs, growth is good in some places. 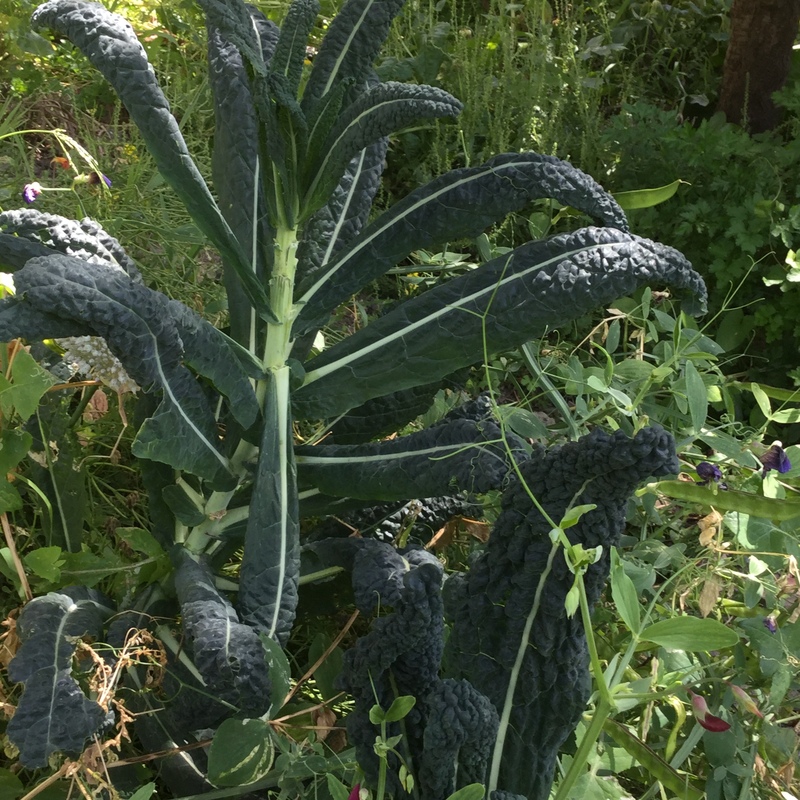 These few cavallo nero plants have done well where last year there were bordoloi beans. This little plot grown from seeds from a well-wisher has been looking good for a while and I love the phacelia, as do the bumble bees. 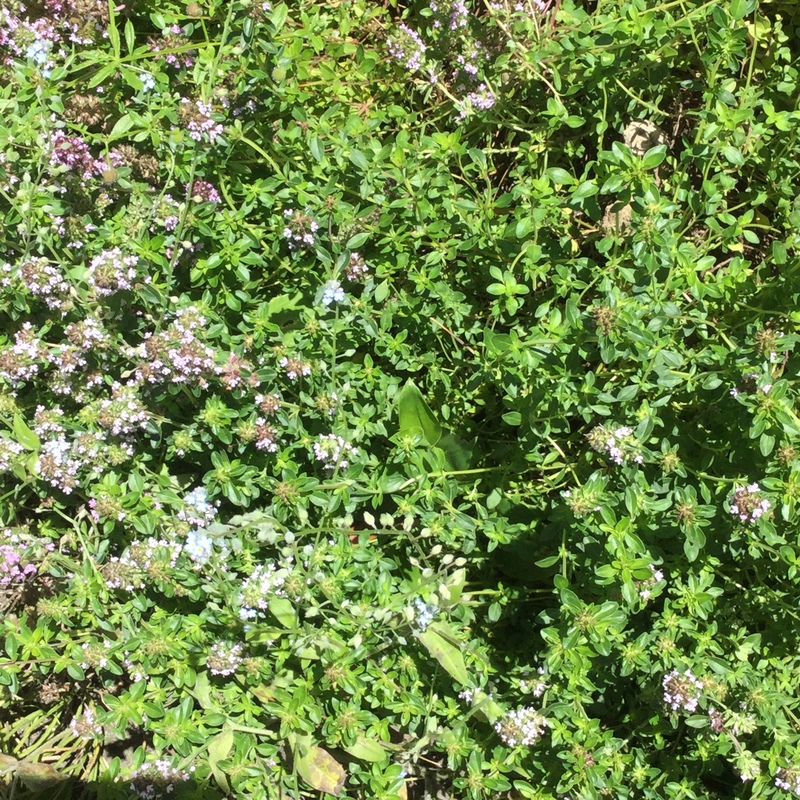 The thyme borders are terrific and much admired, particularly by those who cook. 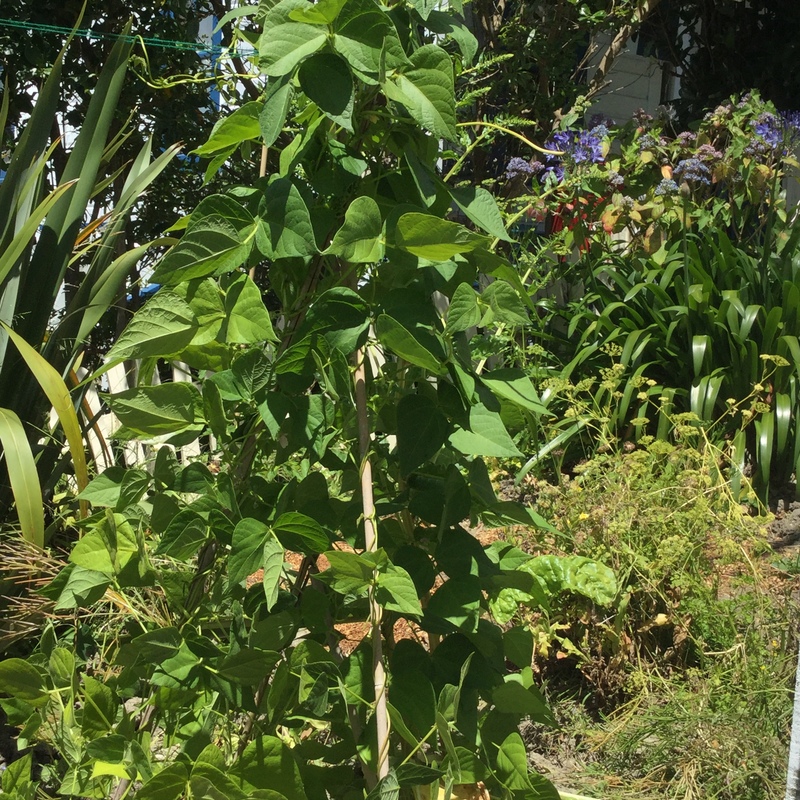 Am about to transplant some to the other side of the zigzag, down from those beans. But it’s not all good. Water runoff, or something harmful in it, appears to have damaged some plants, like this lavender, so I’ve spread organic biochar (it has an awful smell) under organic sawdust, after compost and other soil builders made no difference. I’m going to try the biochar in a couple of other places too, where there was a lot of yucky buried rubbish. My pride-and-joys are three baby manuka trees, which I hope will give local honey bees a treat when they flower. 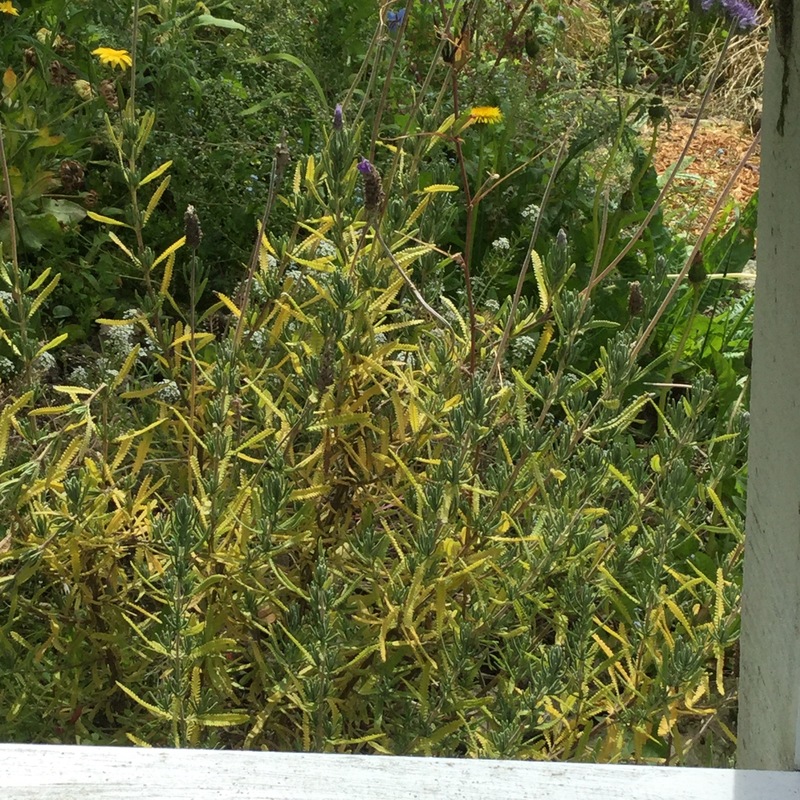 One of them is that little spiky plant in the centre, below, surrounded by dandelions and parsley. Some people see this plot as a ‘mess’. For instance, as in the photo immediately below, there’s silver beet, wild sweet peas, calendula, leek seed heads and more, all mixed in together. near various native shrubs and trees. So I plan a sign that explains that this wilderness is for the bees (who love dandelions and calendula and clover!) and for experiments. I’ll write it on one of the tiles that fly off the monastery roof in the gales. Completely encouraged by that random visitor.